Coconut Shortbread Cookies SMASH the mold when it comes to gluten free and vegan cookies! Do you LOVE coconut? 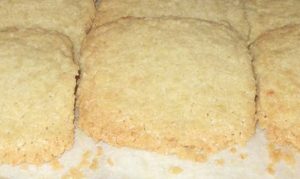 Then our Coconut Shortbread Cookies are the perfect cookie for you. This sweet and crispy cookie is full of high quality unsweetened coconut, coconut oil and the natural sweetness of pure maple syrup.